Pumpkin pie is filled with warm spices that bring the Fall season into full effect. I like to make a batch of pumpkin pie spice to use for all types of recipes from pies, cookies and cakes to adding a couple of dashes to my morning coffee grinds for a dose of light pumpkin flavor. Check out the recipe below and experiment with the warm spices in your spice rack. Place all ingredients into a bowl and stir to combine. Keep in an airtight container to keep fresh. This recipe for summer strawberry pie is really easy and great for picnics, lunches, brunches and parties on hot summer nights. 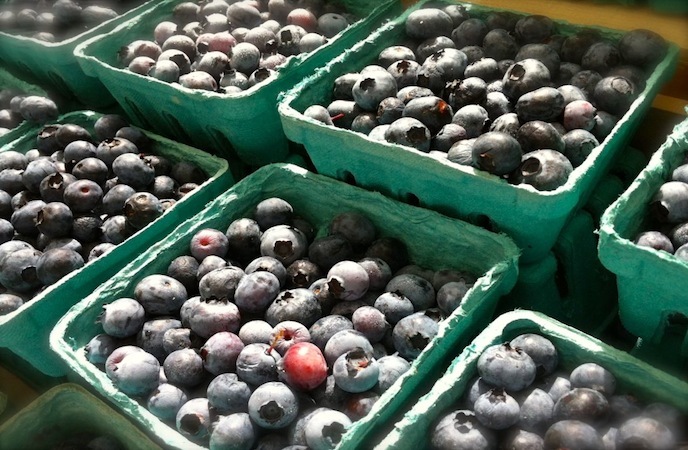 You can use also add all types of summer fruits like blue/black or raspberries, peaches, plums and nectarines. Cook the crust following the instructions for blind baking. Place 1/3 of the strawberries in a pan with the sugar, salt, lemon and cornstarch. Simmer for 15 minutes on low heat then smash the fruit until chunky. You can also place this into a blender and carefully blend until smooth. Let this mixture cool completly. 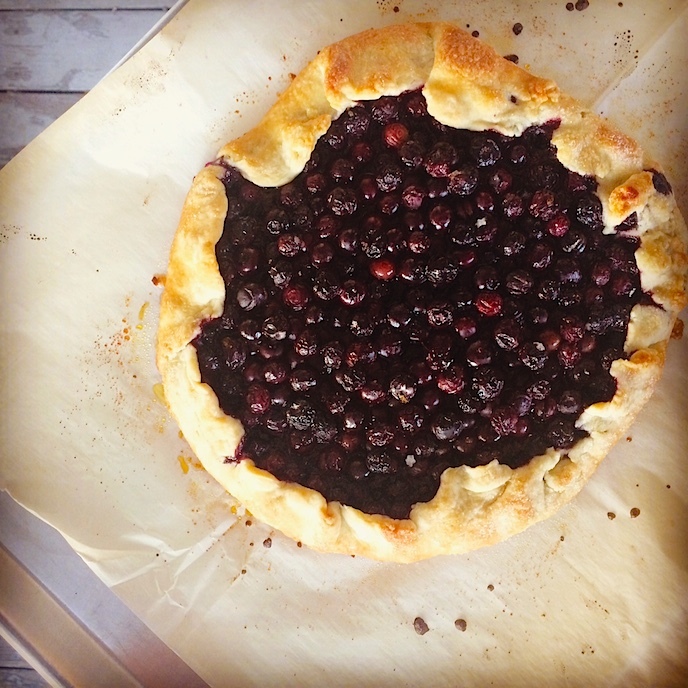 Place the rest of the berries into the pie shell, pour over the berry jam mixture and let chill in the fridge for 2 hours. You can top this with extra berries (blue, black or raspberry), whipped cream and ice cream for an extra awesome treat. In the fall months I love a huge slice of apple pie, but baking a pie is without a doubt the last thing on my list of things to do. I created the recipe below that will give you all of the warmness of a fresh baked pie without any of the work. The first thing you have to do is get some tasty apples and pears, any kind will do. Place the chopped fruit, butter and some dried cranberries into a pan over medium heat and cook them until they are soft. While that is cooking you can whip up some homemade whipped cream sweetened with maple syrup. When the apples are almost done, add some of the pumpkin pie spice, which is a mixture of cinnamon, ginger and cloves. Cook for one minute to release the flavors in the spice. 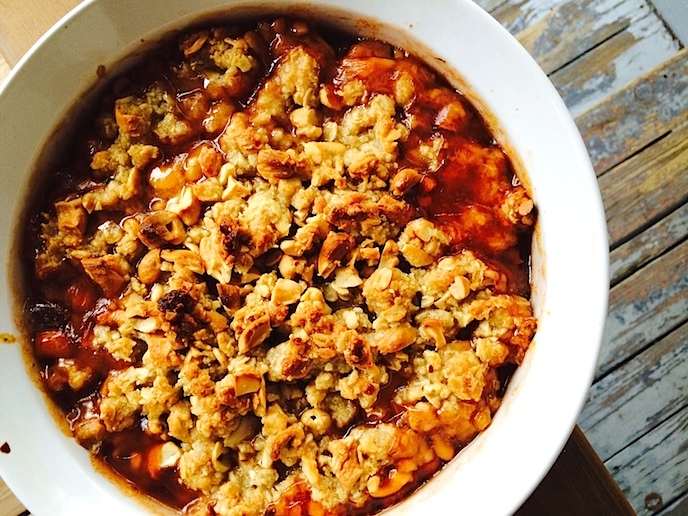 Place the apples in a bowl and top with ¼ cup of granola, which takes the place of a baked crust or crumble topping. Finally, top the dish with a heaping spoonful of the maple whipped cream. This is an easy, quick and tasty recipe for the whole family. You can substitute fresh or frozen, peaches, plums or pineapple and top with any number of granola flavors and creamy toppings. Place a pan over medium heat. Add the butter, apples, pears and dried cranberries to the pan and cook until soft, about 10 minutes. While that is cooking place the cream and maple syrup into a bowl and whisked until thick. Add the spices to the apple mixture and cook for one minute. 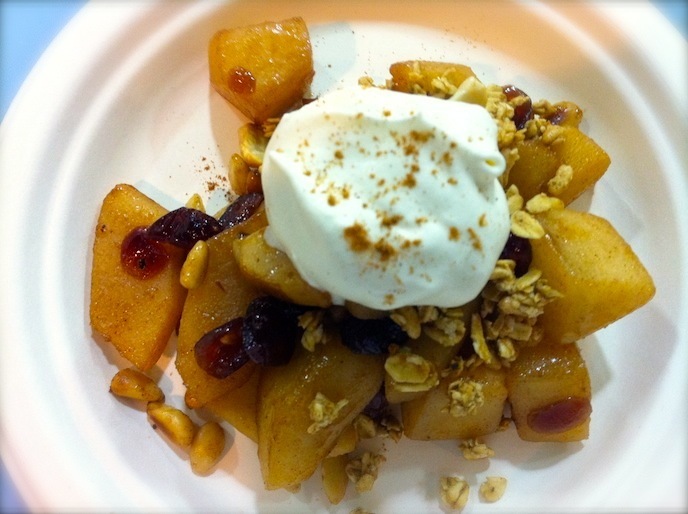 Serve the apples in a bowl and top with the granola and fresh whipped cream. The highlight of my job as the "world coolest cooking teacher" is when I go to Walter Reed Army Hospital in Bethesda and cook with the wounded soldiers. I have been working with the injured service men and women once a month of for the past 4 years. These brave soldiers have been injured in Iraq and Afghanistan on security operation and are at Walter Reed recuperating from a variety of ailments. The injuries that I see in the occupational therapy ward are TBI (Traumatic Brain Injuries), PTS (Post Traumatic Stress) and limb amputations. The soldiers are working on physical and mental skills in an effort to get back on track with ever day life. During our cooking groups they are learning skills including dexterity, flexibility, life skills and sequencing events. Needless to say my teaching skills and patients are in full effect while working in this environment. Last weekend I had the pleasure of performing a cooking demo at the Fresh Farms Famers Market in Silver Spring Maryland. Like most farmers markets throughout the world, this one was filled with fantastic local products (Maryland, Virginia, Pennsylvania) sold by the farmers and artisans themselves. This week's market had local farmers, bakers, meat producers, florists, cheese mongers, and a guy selling some killer kettle corn. When I first arrive at the market I like to walk through to see what's hot. 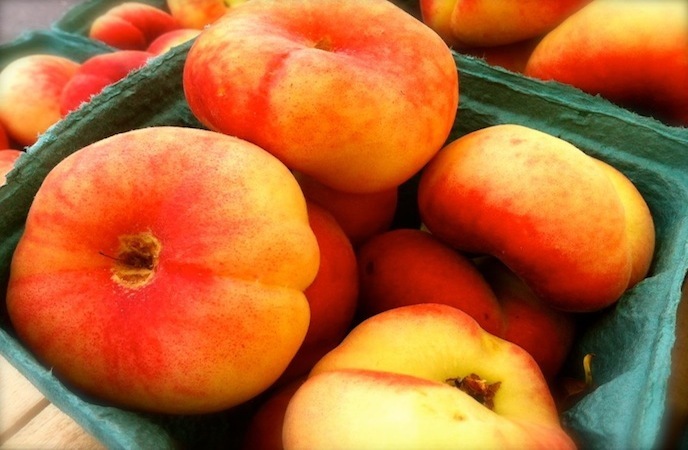 This week stone fruits were overflowing from all of the farmer's stalls. 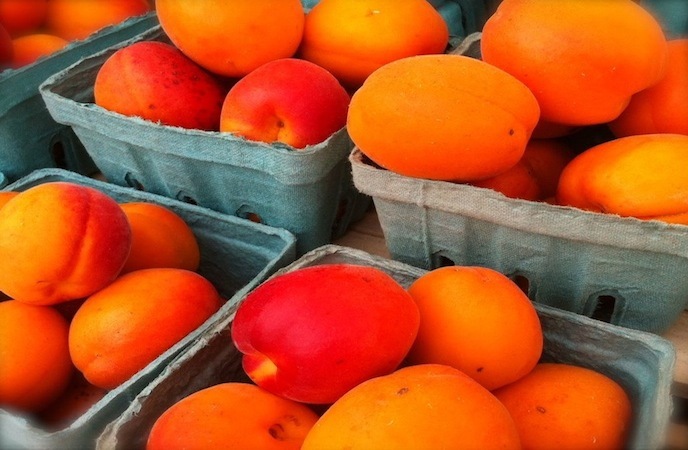 Stone fruits like peaches, plums, nectarines, cherries, apricots, pluot (plum and apricot hybrid) are soft-fleshed fruits with a seed on the inside that is covered with an hard outer shell. They main harvest comes during mid summer and from the sites at the market, this is going to be a good year. Stone fruits can be grilled, cooked into jellies and jams, made into wines and brandy, frozen and canned, and also blended in smoothies, ice cream and sorbets. During the blazing hot summer I like to make a cool fruit salad and serve it over ice cream. 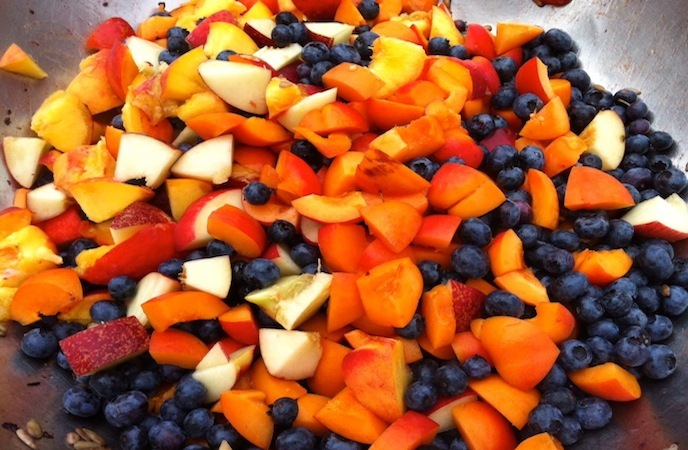 Check out the recipe below for my summer stoned fruit salad and Get Crackin' today! 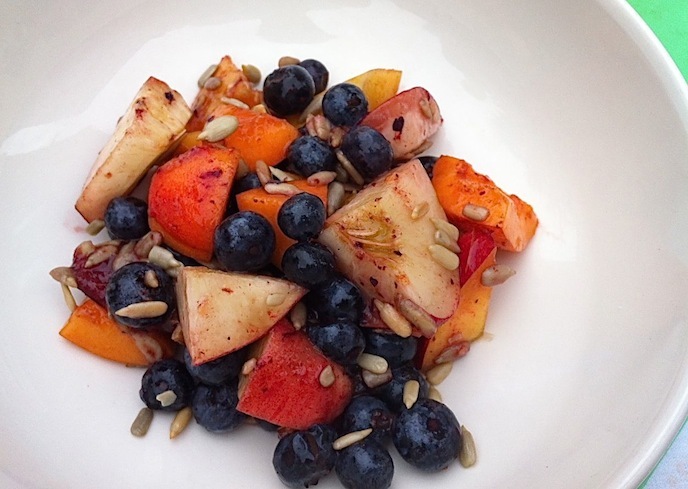 Wisk the dressing ingredients together and toss with the stone fruits, blueberries and sunflower seeds. From ripe summer berries, cherries and juicy watermelons and stone fruits, summer time brings out the best of mother nature. In an effort to eat healthy, locally and seasonally I like to get fresh fruits and veggies into every meal, even dessert. Ginger glazed peaches are an easy dessert to make with big summer flavor. In this recipe, I sautee the peaches in a little butter then simmer them in spicy ginger beer to create a sweet syrup. Pop a peach on a piece of poundcake and top with a dollop of whipped cream, ice cream or whipped ricotta cheese and you have an unbelievably tasty and seasonal dessert. 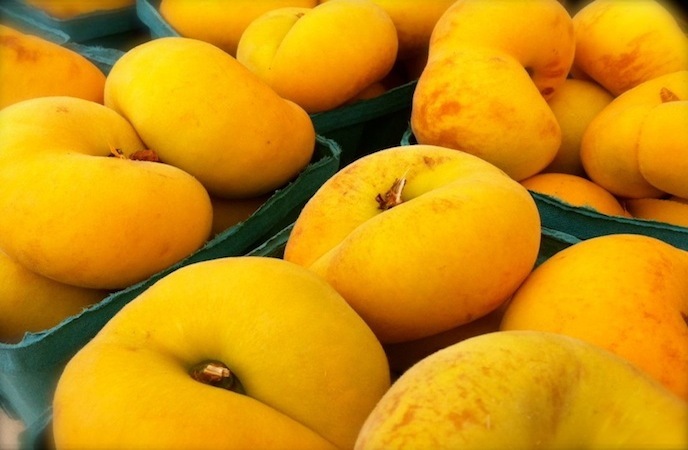 If you don't have fresh peaches you can use canned or frozen peaches that have been thawed or switch up the fruit to pineapple, apricots, nectarines, pears or apples. Whip the ricotta and honey until smooth and keep in the fridge until service. Pre heat a skillet over a medium flame. Heat the butter and when it stops foaming add the peaches face down. Cook the peaches on both sides until slightly caramelized. Deglaze the pan with ginger beer and reduce the liquid until it is like syrup. 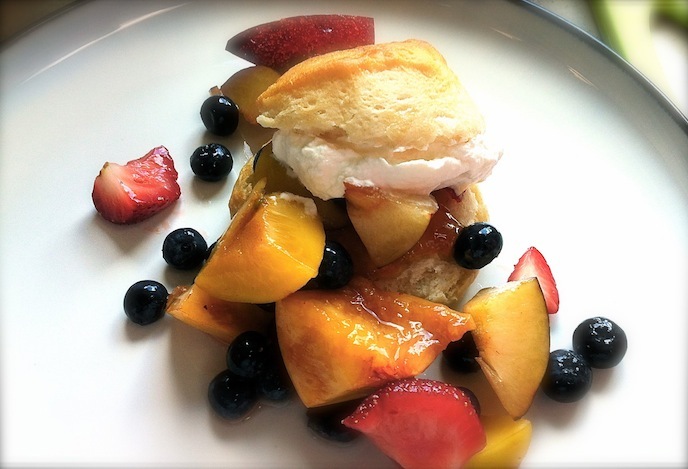 Serve the warm peaches over a slice of poundcake, top with the whipped ricotta and drizzle the sauce over the top. I hope everyone had a great Valentines Day with the chocolate and roses and the loving. Check out my newest Cooking with Egg TV clip, Vegan Chocolate Mousse. This recipe was inspired by one of my vegan cooking classes that I taught about a year ago. Being a vegan recipe, it can't have any animal products or byproducts of any kind. This means no milk, eggs or gelatin! I am no vegan but trust me, this dessert is one of my favorites and will fool anyone that tastes it. Even without all of those fatty, animal based foods, this recipe is full flavored and extremely decadent. It uses avocados as a smooth and creamy base, unsweetened cocoa powder for chocolaty goodness and is sweetened with agave nectar. This is a great new food to use because it is a very sweet liquid that will dissolve easily and bind the mouse together. The video was shot by my friend Wannakhavi Wakisi at Wana Film, edited by Brian Morrison at Woodroom Cinema and was shot in The Foley Household in Silver Spring MD. Music was provided by some very talented artist in Baltimore including Can't Hang, Daren Lake and Lazerbitch, which I think is the coolest name for a band ever! The theme song produced by Jay Crawdads and The Ill Grocer from the funktastic group, Higher Hands. Even if you are not a vegan, this new form of chocolate mousse will blow your mind. The recipe is below and couldn't be easier to make. I hope you enjoy the video. Chocolate covered strawberries are a symbol of romance during the Valentines season. They are also really easy to prepare and will make a big splash with your loved ones at home or at work. Just drop by the grocery store and pick up a quart of ripe strawberries and a couple of chocolate bars and get crackin' today! For a little bit of variety, dip your strawberries in dark, milk and white chocolates.You can also top them with little sprinkles of nuts, shredded coconut, sprinkles and even pop rocks for that extra bang! Remember that you can dip your berries with friends and family for fun event at home or at work, kids love it! 1. Place the chocolate into a bowl, microwave for 30 seconds and stir. Repeat this until the chocolate is melted and smooth. 2. Wash the strawberries and dry them well. Keep the strawberries wrapped in paper towels until you dip. If the berry is wet the chocolate will not stick. 3. Put a sheet of wax paper on a baking sheet. Grab a strawberry by the stem and carefully dip in the chocolate, letting the extra drip off. You want a thin layer of chocolate on the outside. 5. You can boost the look of your treats by drizzling melted white chocolate over the strawberries after the first layer has set.